Adenosine monophosphate-activated protein kinase (AMPK), silent mating type information regulation 2 homologue 1 (SIRT 1), and peroxisome proliferator-activated receptor γ co-activator α (PGC1α) constitute an energy sensing cellular network that controls mitochondrial biogenesis. Caloric restriction activates both AMPK and SIRT-1 to increase ATP production from fat oxidation. We characterized AMPK and SIRT 1 expression and activity in human skeletal muscle in response to dietary fat or carbohydrate intake on the background of either overfeeding or caloric restriction. AMPK phosphorylation and acetylation of PGC1α (as a measure of SIRT activity) were determined. Euglycemic-hyperinsulinemic clamp and muscle biopsies were performed in human subjects participating in 2 separate studies. In study 1, 21 lean healthy individuals were overfed for 5 days, while in study 2, 18 obese otherwise healthy individuals consumed a calorie-restricted diet for 5 days. 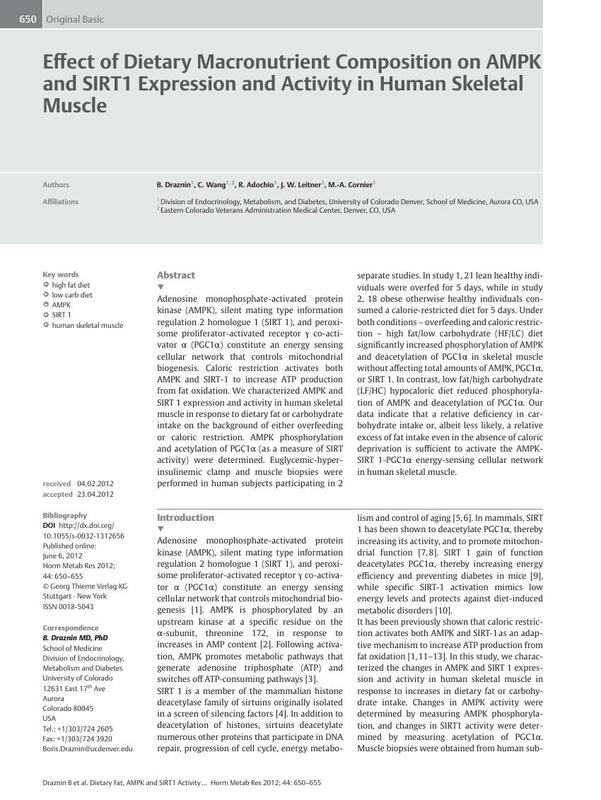 Under both conditions – overfeeding and caloric restriction – high fat/low carbohydrate (HF/LC) diet significantly increased phosphorylation of AMPK and deacetylation of PGC1α in skeletal muscle without affecting total amounts of AMPK, PGC1α, or SIRT 1. In contrast, low fat/high carbohydrate (LF/HC) hypocaloric diet reduced phosphorylation of AMPK and deacetylation of PGC1α. Our data indicate that a relative deficiency in carbohydrate intake or, albeit less likely, a relative excess of fat intake even in the absence of caloric deprivation is sufficient to activate the AMPK-SIRT 1-PGC1α energy-sensing cellular network in human skeletal muscle.